ABOUT CAVELAND: The history of Caveland is 300 years old. This complex was originally used as a winery. The grapes were collected from local vineyards that are surrounding it. Afterwards they were mashed in a well that is located at today’s reception. Finally the wine was stored in the caves that are now converted into cave rooms. 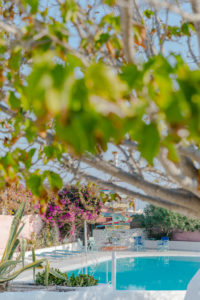 This place was later known as a tennis club and it was in the late seventies one of the first hotels in Santorini. It was refurbished and re-opened in 2011 as a boutique hostel. It offers a mixture of private and dorm-style accommodation. The property is a 15 000 sqm large with a big pool, numerous gardens and hidden corners. 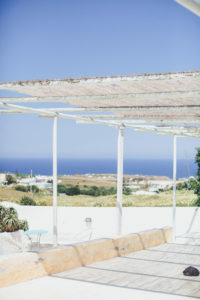 It is in a picturesque village of Karterados just next to Santorini’s capital Fira town. Karterados village lies on the main bus route connecting Fira with the south of the island. Therefor the location is ideal for those who want to explore the island and still be away from the crowds. Here is Caveland website. We practice hatha flow in the morning. Furthermore in the evenings we will do yin yoga, guided meditation, yoga nidra, pranayama and slow seated yoga sequences. This yoga retreat is suitable for eager yoga students of all levels. Minimum number of participants is 3 people. Maximum number of participants is 10 people. Extras: airport /port transfer, entrance to excavations in Akrotiri during the private tour, the rest of the meals. This cave has a double bed inside and therefor it is suitable for a single traveller or for a couple. It has its own private bathroom and also a small kitchen. If you are 2 people willing to share this cave, please email me for the prices. The second person does not have to participate at the yoga. – One bed in a private two bed twin cave with a private bathroom: 560 Euros/ 1 person. This cave has 2 single beds inside and it is suitable for 2 friends. Alternatively, we can try to match you with another participant. It has its own private bathroom and also a small kitchen corner. If you are a group of 3-4 people willing to share this accommodation, please email me for the prices. The extra persons do not have to participate at the yoga. – A small single room with a shared bathroom: 570 Euros. Single room that is sharing a bathroom with a 4 -bed girls only dorm. – A medium sized single room with a shared bathroom: 650 Euros. Single room that is sharing a bathroom with a 6 – bed mixed dorm. During our yoga retreat in Santorini we serve a morning vegetarian brunch with a variety of fruit and home-made pastry. Moreover after the first evening class we will have a Greek sampling dinner at a local tavern. We will taste a variety of typical local dishes, certainly all vegan/vegetarian (depending on the group and their dietary requests). There is also a fully equipped kitchen with a stove and an oven in the communal kitchen in Caveland. Likewise most of the private caves have also a kitchen corner. Above all local grocery stores are within a walking distance from Caveland and they offer a wide range of local seasonal fruits and vegetables, too. If you are interested in this retreat, just email me at info@yoga-santorini.com . I will send you an application form and I will advice on the payment and booking procedure.